What do you picture when we say, “measurement strategy”? Do you think in terms of vague business goals? Unrealistic campaign objectives? An Excel sheet of basic KPIs and metrics? You’re not alone. A lot of marketers are approaching digital content strategies the wrong way. Sure, having clearly defined metrics relating to bigger picture KPIs is critical to measuring the success of any website. However, the most important factor in a measurement strategy often takes a backseat – and that is – your audience. 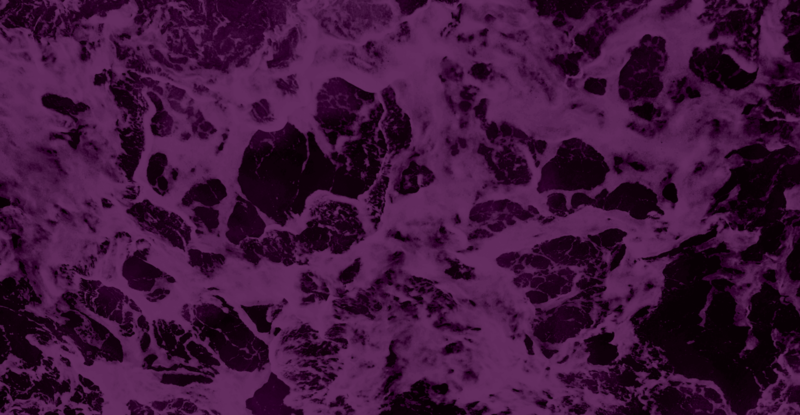 You can have the most elaborate digital strategy in your industry, but without a focus on those on the receiving end of the experience – your user – it all falls flat. In this post, we’ll walk you through how to approach an audience-first analysis that can help improve your website’s measurability. How do they interact with my site? Why did they take the actions they took? Did they have any friction in their experience? What do they need but aren’t getting? What do they want more of? 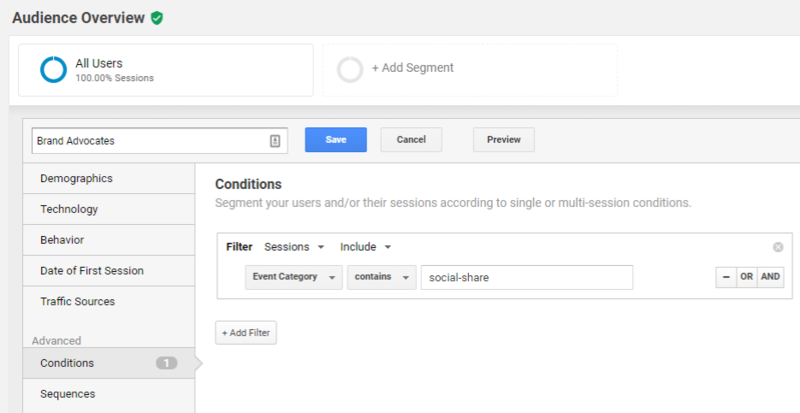 In order to answer these questions about your users, you can build out quantitative personas with Google Analytics ‘advanced segments’. 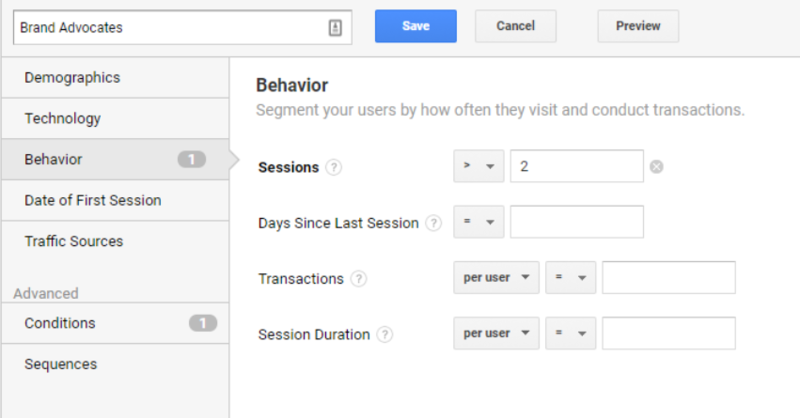 What are advanced segments in Google Analytics, and how can I use them to analyze user behavior? ADVANCED SEGMENTS are subsets of Google Analytics data. Segments allow you to isolate and analyze users/sessions/hits based on the specific criteria you outline and define as belonging to that group. Take “Brand Advocates” for example, these are users who you’ve identified have performed a series of actions on site that demonstrate they’re huge fans of the brand – this could involve multiple sessions, social shares, you define the criteria. Below is an example of how you can build out a simple audience segment by 1) setting a criteria for session, and 2) adding a unique condition at the user or session level. The following example uses the Behavior tab to segment users who have had more than 2 sessions, and the Condition tab to segment those who have shared content from the site to Twitter. The combinations you can make are endless and highly customizable depending on the types of behaviors you want to track. Having segmented these Brand Advocates – you can analyze the specific actions they are taking on your site and make business decisions based off of your learnings. By analyzing data through the lens of audience segments, you take an audience-first approach to measuring your websites performance. 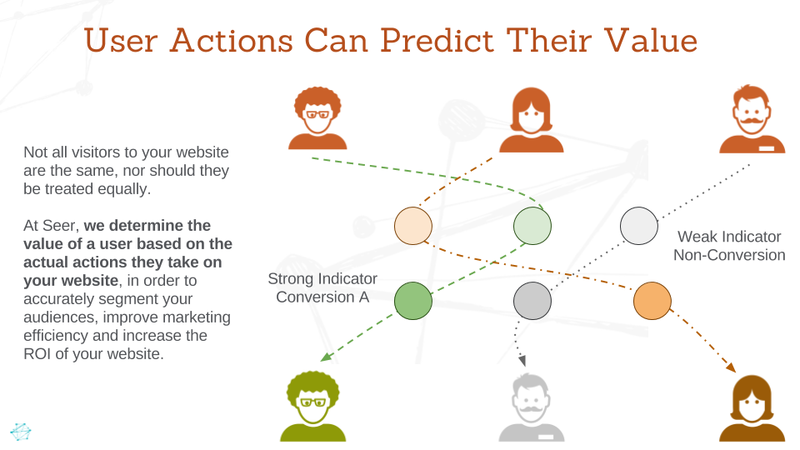 Hopefully you now know how beneficial it is to focus on the user as you develop a measurement strategy for your site. 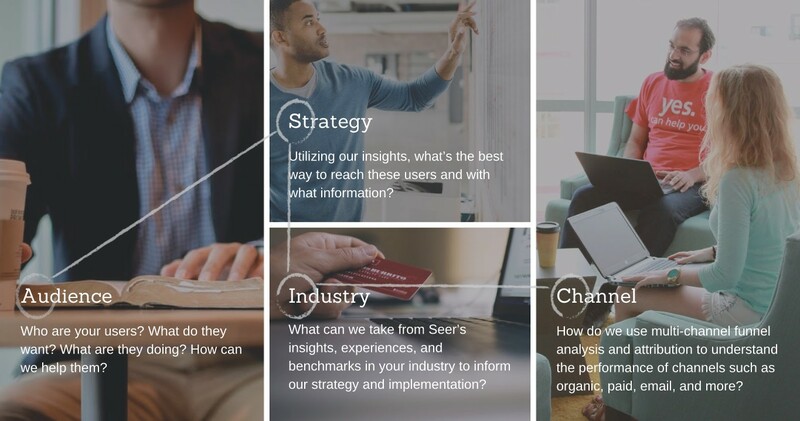 If you’re still a little fuzzy – give our Analytics team a shout or visit the official Seer ASIC hub for more on being “audience-first” .